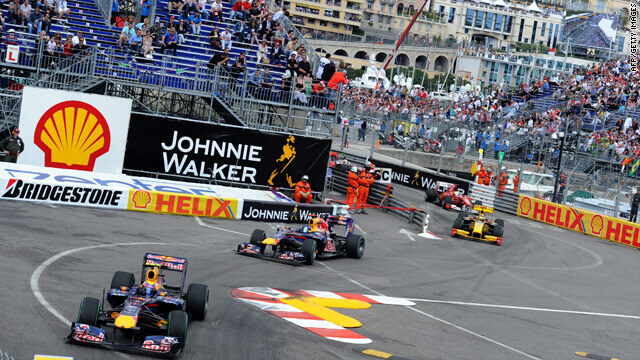 The streets of Monte Carlo are home to the most prestigious race on the F1 calendar. Ever since they started racing cars around the city streets in 1929, the Monaco Grand Prix has been one of the most glamorous sporting events of the year. Within just a few days in May, roughly 70 million euros are poured into the economy of the tiny principality as movie stars and models, the rich and the famous, flock to the trackside. For the drivers it’s the race to win. For everyone else, it’s the race to be seen at. But it’s not all fun and games. It’s a serious business for the teams and their drivers as the meandering miles of Monte Carlo are more challenging than most. I saw for myself how cluttered the facilities were as burly truck-drivers and weary mechanics tried to unload their equipment into their tiny garages. It didn’t help that one of the Mercedes trucks had been badly parked – a serious misdemeanor in a community proud of its meticulous maneuverings, and one that frayed tempers in neighboring garages – but there clearly was never going to be enough room for everyone to unload without stepping on each other’s toes. And this was only Monday. Laden with high-performance race cars, spare parts and space-age tool kits, the Force India team take five trucks (others have more) to every race in Europe. But there’s only room for one truck at the Monaco track, so there will inevitably come a point when they’ll need something in a hurry and it’ll be located on the other side of town. And getting across town isn’t easy either. On a “tour of the track” with 2004 winner Jarno Trulli, the idea was for us to drive to the iconic tunnel, hairpin and chicanes and hear forensic analysis on how to drive it. Jarno was enlightening, but enraged in equal measure as we became tangled in rush-hour traffic and struggled to park. It wasn’t long before he was honking his horn and leaning out of the window and gesticulating wildly. That I was even able to experience any of the track with a current driver is a part of Monaco’s charm though. Everything is so accessible and I guess that’s one of the reasons it’s so popular with the fans. At one point this week I found myself waiting for a taxi by the start/finish line. I was sitting on the winners’ podium. It’s astonishing how close you can get to the action, both before the event and during the race. If you don’t mind the mix of exhaust fumes and foie gras, you can dine just meters from the track at the Hotel de Paris. It’ll only cost you 1,350 euros for the privilege. In a microcosm, that is the energy and eccentricity that makes Monaco so captivating and memorable. Let’s just hope the race of 2011 lives up to the billing!